In the above competition more than 17 countries from the world participated. With these four medals the total tally of international medals won by Raghvendra went to 28. He is a member of Swimmers Club Belgaum and Aquarius Swim Club Belgaum and practicing at Rotary Corporation Sports Academy’s Swimming Pool under the watchful eyes of Swimming coaches Umesh Kalghatgi, sudhir kusane, Prasad Tendolkar, Anandeshwar Patil and Kallappa Patil and does his Fitness programme at Gold’s Gym, Belgaum. 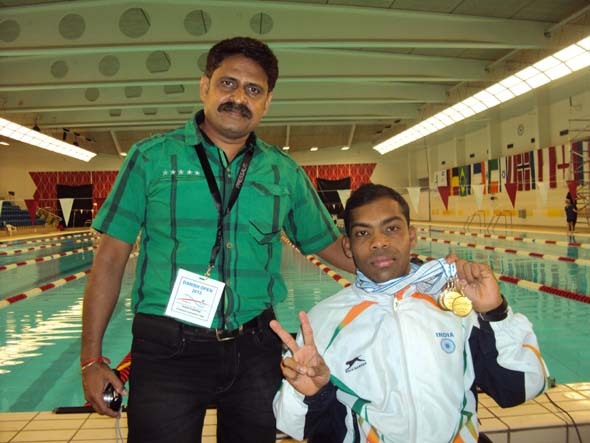 He is supported by Paralympic Committee of India, Karnataka Swimming Association Lead, Purple Nest, shri Suresh Hundre, Rtn Avinash Potdar, Mrs Maneck Kapadia, Mrs. Lata Kittur, Shri S. R. Sindia, Rtn Basavraj Vibhuti and others. Great, positive and truly inspiring story for today’s young generation. Congratulations to Ragvendra and his coaches, Your wins are inspiration to many in the days ahead. Wishing for many more success for the swimmers club. CONGRATS RAGHAVENDRA , YOU HAVE MADE BELGAUM GREAT. This is an amazing achievement. Congratulations to raghavendra and his coaches.